Epigenomics in Health and Disease discusses the next generation sequencing technologies shaping our current knowledge with regards to the role of epigenetics in normal development, aging, and disease. It includes the consequences for diagnostics, prognostics, and disease-based therapies made possible by the study of the complete set of epigenetic modifications to the genetic material of human cells. 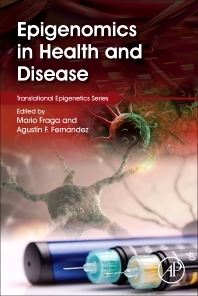 With coverage pertinent to both basic biology and translational research, the book will be of particular interest for medical and bioscience researchers and students seeking current translational knowledge in epigenesis and epigenomics. Coverage includes the latest findings on epigenome-wide research in disease-based profiling, epidemiological implications, epigenome-wide epigenetic studies, the cancer epigenome, and other pervasive disease categories. Graduate students, health care professionals, university researchers, pharmaceutical companies interested in drug development and biotechnology companies. This book could also serve as a core textbook for advanced university or professional school courses with a focus on genetic and/or human diseases. 9.9 DNA Methylation Changes: Cause or Consequence of Cancer? 12.4 Do Diet and Exercise Interventions Alter the Epigenetic Pattern and Potentially Risk for Metabolic Disease? 12.5 Does the Intrauterine Environment Alter the Epigenetic Pattern and Potentially Risk for Metabolic Disease?